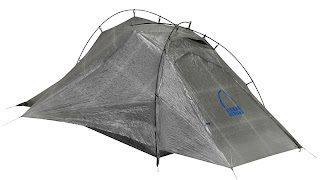 Cuben fiber is increasingly appearing in high-end ultralight gear, from the featherweight tarps and shelters of Hyperlite Mountain Gear to gram-counting stuff sacks from Zpacks to the just-announced 27-ounce Sierra Deisgns Mojo UFO two-person tent. But what exactly is cuben fiber anyways? And why does it cost so much? I’m not kidding about the price. Those Hyperlite shelters? $500 and up. The Mojo UFO? A wallet-splitting $1,799. The stuff sacks from Zpacks are your most reasonable option for getting your hands on this space-age material. 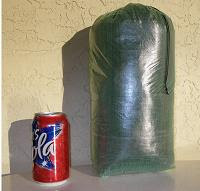 A 0.3-ounce medium stuff sack will run you only $15.95. Produced and marketed by the Cubic Tech Corporation in its CTF3 product line, cuben fiber is a non-woven fabric that sandwiches Dyneema fibers between two layers of composite laminate material. (With a strength up to 15 times that of steel, Dyneema is dubbed “the world’s strongest fiber.”) The resulting fabric is extremely strong, waterproof, and highly tear-resistant. As to the cost? Well, if only one company is making a product, and it uses both expensive ingredients and a costly production process…you do the math. In the coming years, I would expect this sort of technology to come down in price and potentially replace silnylon as the go-to ultralight fabric. But I’m not holding my breath for this to happen any time soon.